Congregation Sha’arey Israel is an egalitarian synagogue dedicated to the celebration of Conservative Judaism and Jewish Life in Middle Georgia. CSI is a 100+ year-old community which has strengthened over the years because of our dynamic programs and worship services and because of the warm and dedicated families who call CSI home. Many of us are natives who have lived in other places but returned home to Macon and CSI because we missed the family feeling that is nurtured here. And many of us moved from big cities to this little big city to find that sense of family. 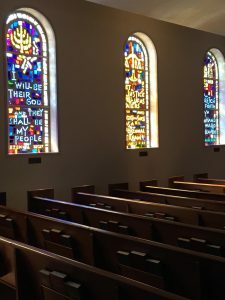 Congregation Sha’arey Israel is a spiritual home where children and adults are inspired to explore Judaism and find new and meaningful ways to make God an integral part of their daily lives. We strive to serve the ritual, religious, social and educational needs of our members and to instill a deep sense of pride in our unique Southern Jewish identity and heritage. We are so glad that you are visiting our website and hope that you will come see us in Macon. After all, Congregation Sha’arey Israel is how you say Hamish in Southern.